This week I’ve regressed to the traditional “What I did for my summer holidays” theme, as I suspect everyone has had more than their share of psychology. 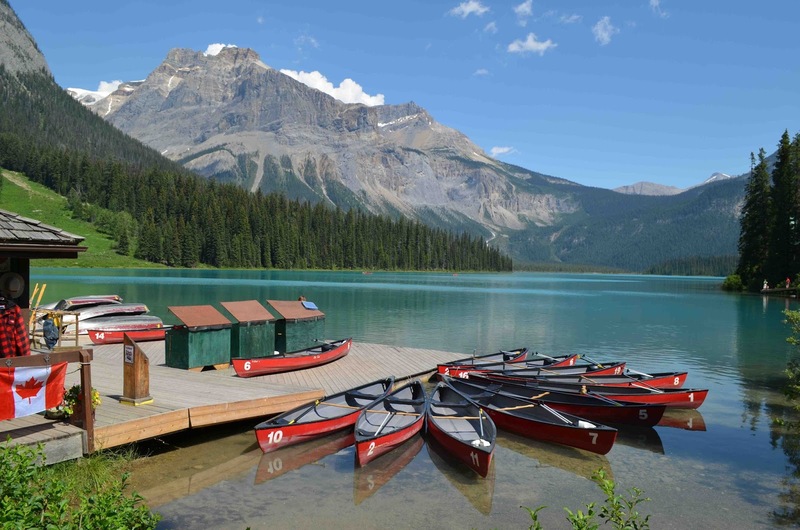 Yoho (Cree for ‘awe,’ so essentially “Awesome National Park”) is located in eastern British Columbia, bordering Alberta’s more famous Banff National Park. It’s smaller as well, at 1313 square km (relative to Banff’s 6641 sq km) and easy to miss as you drive through. Great engineering maybe, but the nature is better. Yoho is perhaps most famous for its least impressive sight, the spiral tunnels. When the Canadian Pacific railway was built in the late 1800s, the designers opted for Kicking Horse Pass, which has a sharp steep slope that initially required a 4.5% grade. This wiped out the first train to attempt it, and eventually they constructed a pair of tunnels that entered Mount Stephen, looped inside the mountain, and emerged higher up. A great engineering feat, but the “tah dah” watching trains go through the tunnels is actually not so astonishing. Yoho is great to drive through. For one thing, if you’re going east it means you survived the worst stretch of the Trans Canada Highway between Golden and the park (they’re trying to do something about this, but they have a long way to go). The real attractions, though, are off the highway. One of the best, I understand, is the Lake O’Hara hiking area. This takes more organization than I could muster driving back from an Alberta family wedding, so I didn’t see it. 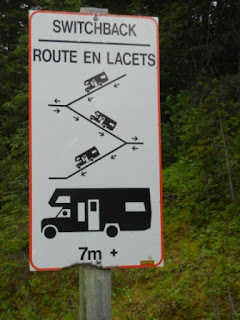 You can hike the 11km access road to the area, or you can advance-book a public bus that drives you in, allowing you to hike directly from there, camp at the small campground, or stay at the luxury lodge there. The daily quota for the bus is 42 people to ensure the area is not over-run. Maybe next year. This year we stayed in the tiny (200 people or so) former rail town of Field, home of the park’s visitor centre. Every house there seems to be a B&B or backpacker lodge. 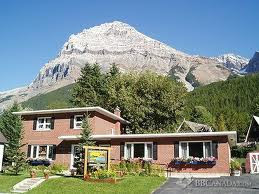 We booked the Canadian Rockies Inn. British Columbia towns can sometimes be a dead zone for food, but Field has a great restaurant, Truffle Pigs, that rivals anything Vancouver has to offer. Even if you’re just driving through, this is enough to make Field a destination stop. And it’s half the price it would be in any city. So if you’re too disorganized to have pre-booked the O’Hara bus and too lazy to walk 11 km to the trailhead, what do you do? 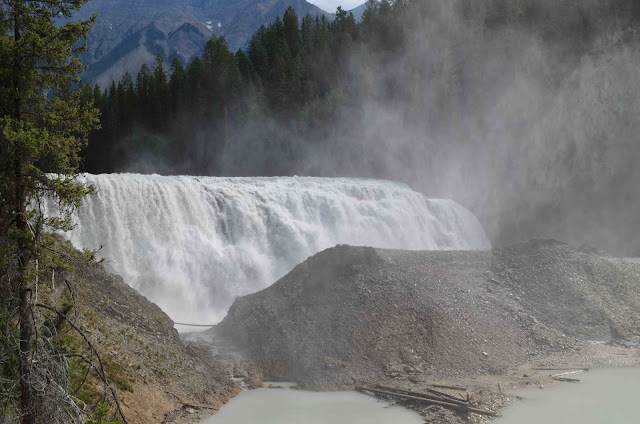 Wapta Falls is a short (4.6km return) flat hike near the western border of the park to a 30m drop in the Kicking Horse River. Easy and a nice payoff for small energy investment. 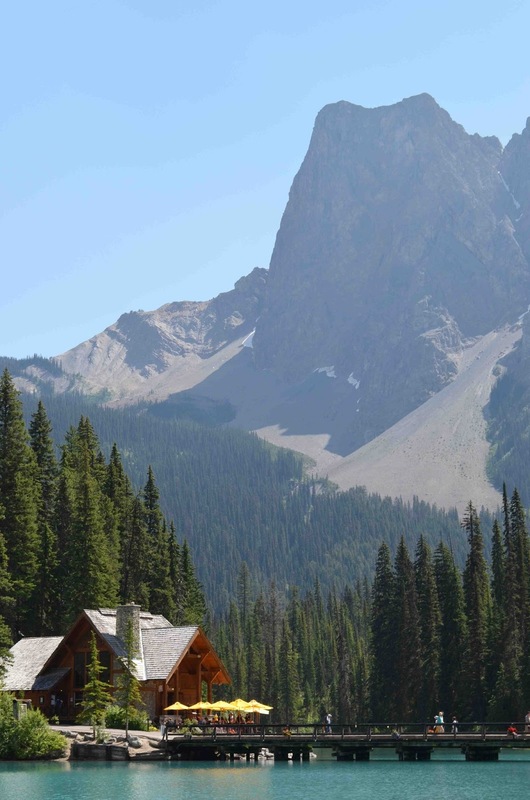 Emerald Lake, near Field, has a beautiful bring-your-wallet lodge composed of duplex cabins on a peninsula jutting into a stereotypically turquoise lake. There are restaurants, a 5.2 km circuit trail of the lake, and canoe rentals for a ridiculously Canadian experience. We rented one for an hour, which is about all you need. 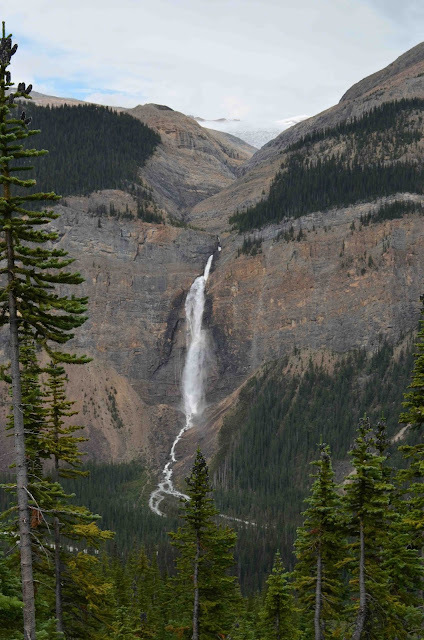 Then there’s Takakkaw Falls. Yoho Valley Road, just east of Field, leads upward in a fairly civilized way to a set of very steep, narrow switchbacks, beyond which is a great drive through a mountain valley to the falls and the trailhead for the Iceline, which was our destination. The chilling answer: They didn’t. Buses and other large vehicles drive up to the first switchback, then have to reverse up the hill to the next switchback, then forward to the next. Coming down the hill they do the same thing, but backwards. I have no ambition to experience this personally. The falls are worth seeing, a 254 meter free-fall drop down a rock cliff. Visitors can walk almost to the base, where the falls are more like rain. The Iceline Trail is billed as one of the best hikes in the Canadian Rockies. We got up above the treeline following the trail from the Whiskey Jack Hostel close to the Takakkaw Falls area. Then, inevitably, a lightning storm came up and we retreated back from the exposed top. Next time for sure. Yoho may be smaller than Banff, but it gets much less press and so is much less of a tourist circus than Banff and Lake Louise (both great places, but packed for much of the summer). My impression was of only a few hundred visitors within the park while we were there during primetime summer holiday season. For example, we saw only two people (I think) on the Iceline trail while we were on it. Time for an update on the Continuing Education workshops that Changeways Clinic will be offering this fall in Vancouver. What if you're not located in Vancouver? Well, come visit us and make some CE a part of the trip. Or check out our workshop guide here and arrange to have a program in your own city or region. The Changeways Core Program is the most widely-used group depression treatment protocol in Canada, and has been implemented in Australia, China, the United States, and Great Britain. Chinese, Farsi, Arabic, and Spanish editions are also available. Designed from a cognitive-behavioural and psychoeducational perspective, this evidence-based program is designed for adults coping with depression or adjusting to difficult life experiences. 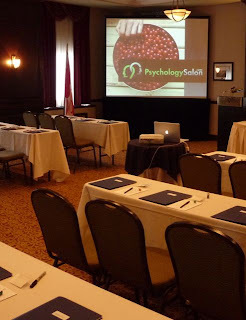 The two-day training workshop provides all the materials necessary for professional therapists to offer this program - in a group format, or as an adjunct to individual therapy. The program is approved for 13 CE credits from the Canadian Psychological Association. For our workshop calendar and online registration: Click here. For a downloadable pdf describing the program: Click here. "Be empathetic," they say. "Be warm. Build up an effective working alliance." But we seldom hear exactly HOW these mysterious tasks are to be accomplished. The so-called non-specific factors in therapy are acknowledged to account for the lion's share of variability in psychotherapy outcome, but they are seldom made explicit. Whether one adopts a therapy model believed to work entirely through the alliance, or a technique-focussed model such as cognitive behaviour therapy, an effective working relationship between clinician and client is a prerequisite for change. This workshop presents specific, behavioural practices designed to maximize therapeutic progress. 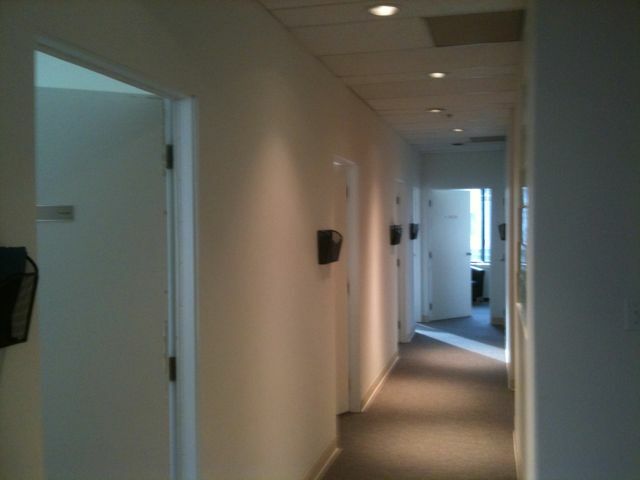 Good for 6.5 CE credits (Changeways Clinic is an accredited CE supplier with the Canadian Psychological Association). We were taught assessment strategy, how to conduct therapy, and when to refer - but not how to perform many of the central activities involved in running a private practice. So we stumble through, gradually picking up ideas and skills as we go along, and about the time we’re planning our retirement we begin to think we understand. But running a practice doesn’t have to be difficult. Many of the skills can be communicated and learned relatively easily. This program covers a wide variety of strategies to make your practice more successful, more effective, and more fun. Good for 6.5 CE credits (Changeways Clinic is an accredited CE supplier with the Canadian Psychological Association). That's it? Well no, there are some other programs going on, but others are hosted by particular agencies or organizations for their own staff. These are the ones available for mental health professionals to sign up for. 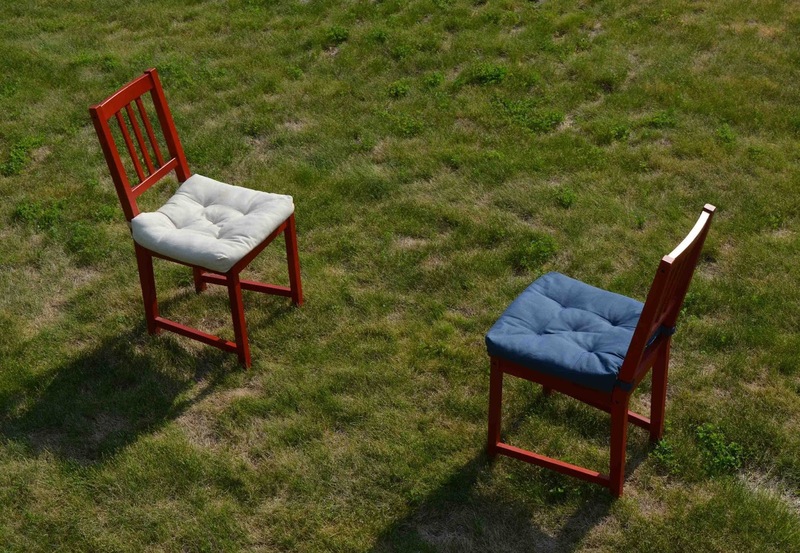 The Therapeutic Alliance: A Benefit or a Liability? 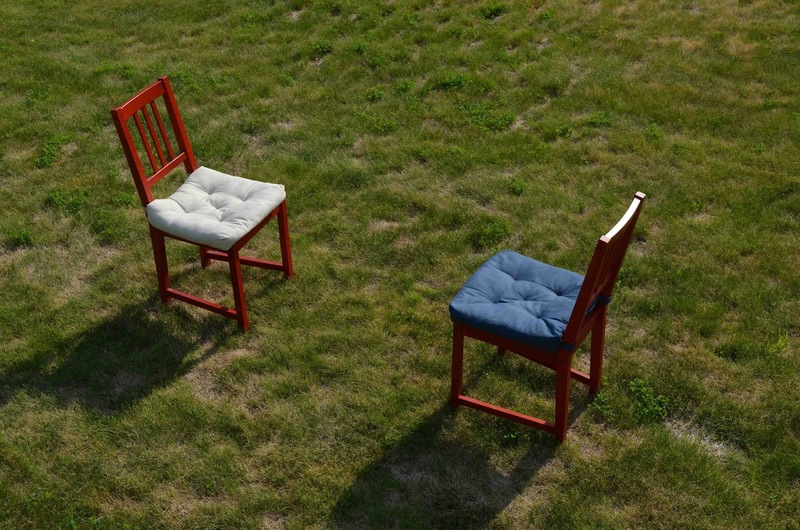 When talking about self-help or internet-based approaches to psychological therapy or self-management, people routinely point out a problem with such therapist-absent approaches: The demonstrated value of the therapeutic alliance. 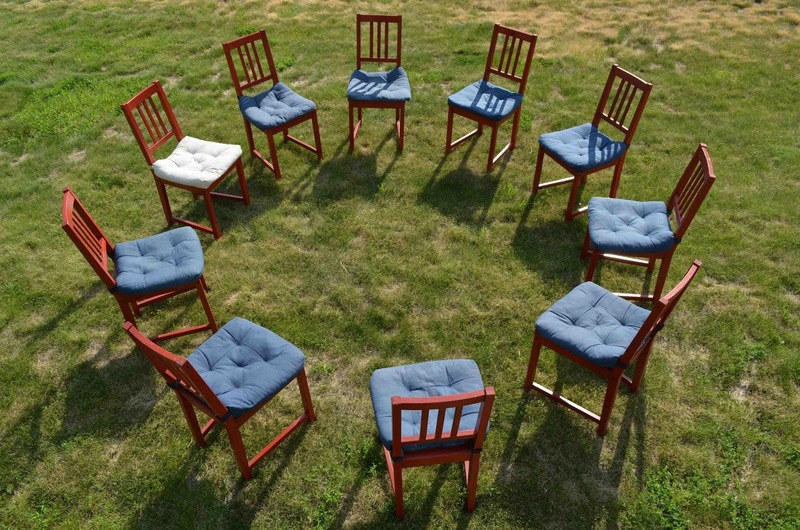 The alliance is a general term for the complex relationship between therapist and client, composed of mutual understanding, empathy, an agreement on the goals and methods of change, and so on. Studies routinely show that the quality of the alliance is a stronger predictor of therapeutic change than is the modality of psychotherapy being delivered. If this is the case, then self-care focused strategies have a real problem. How can there be a genuine alliance if there is no real relationship with the clinician? We might sense that the author of a self-help book or the teacher in an online course is a nice person, but clearly they have no real relationship with the user. If the potent factor in therapy is the relationship, and we have a therapy with no relationship, how could the therapy be effective? In nutritional terms, it would be missing the crucial vitamin. Arguments like this presume that the effect of the alliance is, in a sense, additive. Sure, there may be some useful information in a less personal modality like a self-help guide, but the relationship adds something important. Could the relevance of the relationship be subtractive, instead? In order to find a relation between alliance quality and outcome, there has to be variability in the alliance. Some therapist-client pairs have to have a better alliance, others a worse one. We have been presuming that the good alliance adds something extra to whatever is delivered in therapy. What if this is not true? What if, instead, a bad relationship subtracts from the impact of what is delivered? In other words, what if the alliance looks important not because a good alliance is so great, but because a bad one fouls things up so badly? If the alliance is only subtractive (which I suspect is unlikely), then it would actually be better to have a form of therapy with no alliance at all. A self-help book, a therapy guide, an online lecture-format course, all of which have no off-putting relationship factors, would be the ideal form of therapy. It’s a nice thought, but glosses over the obvious anxiety. Perhaps I expressed myself clearly in the book but would be less concise, less organized, and less effective in person. As well, readers of the book can imagine me as any kind of teacher they like. In person they might discover that they don’t like my way of speaking, the shape of my nose, or my obnoxious habit of interrupting. Perhaps I am literally a better therapist on paper than I am in person. I suspect this is often true. How often have we met our therapeutic gurus and been disappointed with their narcissism, or imprecision, or sloppy technique? Reading their words we can see and understand their points, reflect on how the ideas relate to our own lives, and calmly decide how to put changes into effect. Faced with a sneezing, ill-dressed, imperfect individual, the waters are sometimes only muddied. And gurus or not, we have all seen individuals dispense undeniably good advice in such a ham-handed manner that no one in their right mind would accept it. Forget my name, act as though you don’t care, shout me down, and then tell me to exercise, be nice to myself, eat my vegetables, and make enjoyable activity a priority in my life. I’ll do the opposite just to spite you. I imagine that in actuality the effect runs both ways. A good therapist can add to their content with a warm, inspiring nature, and a bad one can subtract from otherwise good material by alienating the client. But we only hear about the former, leading many to assume – almost certainly wrongly – that the alliance is crucial for people to get anything out of a psychological intervention. The evidence on therapist-absent approaches suggests otherwise. Can you perform therapy on yourself? Well, in a word, no. Psychotherapy is inherently an interaction between client and clinician. But you can use many self-care strategies on your own. Our clinic has developed a cognitive behavioral guide to self-care for depression. Though not a substitute for professional face-to-face care, UnDoing Depression may be a useful adjunct to your efforts. The preview is below. For 50% off the regular fee of $140 USD, use coupon code “changeways70” when you visit our host site, here.